I am thrilled about my debut puzzle being published in the NYT. After solving these puzzles for over 30 years, I pursued my dream of writing a crossword puzzle after retiring from teaching kindergarten. After deciding that I wanted to literally put "poetry" in motion, I worked on this puzzle for a long time. It was submitted in January 2015. When it was accepted in May, I was ecstatic that my dream came true. Constructing this puzzle gave me an even deeper respect for all puzzle creators. I am grateful to Will Shortz for selecting my puzzle. The length of the theme entries in this puzzle created an opportunity to have more longer across answers than is normally seen. I hope solvers enjoy this feature and the puzzle. Impressively smooth debut from Kathy, whose husband got his debut in the LA Times just over a year ago. She gives us POETRY IN MOTION, or the letters P O E T R Y mixed up within phrases. 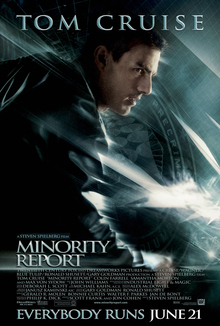 I love the phrases Kathy chose, as MINORITY REPORT was one of my favorite Tom Cruise movies, and PYROTECHNIC is just plain fun. Was anyone else addicted to "Dance 360," with Kel shouting out to the PARTY PEOPLE as DJ K-Sly dropped the beats? Even experienced crossword constructors tend to have a rough time making Monday puzzles. I think an ideal Monday puzzle should be accessible to all sorts of newer solvers, which means all crossings should be very fair, with leeway for gaps in people's knowledge bases. They should also strive to keep the crossword glue to a minimum, as these ugly bits can elicit a head-scratching reaction from newer solvers. So I was a little worried when I opened up the file to see a 74-word puzzle — most new constructors stick to a 78-word puzzle, which is much easier to execute on. There was a bit of A TALE / ASEA in the east section, but that's all I noticed during my solve, aside from a stray AGA. And for Kathy to work in such nice vocab as MAELSTROM, RENEGADES, CADENCE, even SPARROW with its interesting clue [Fictional pirate who shares his name with a bird] — that's really nice work. It shows how much care and time she put into making this puzzle. I wasn't as taken with the theme concept, as POETRY IN MOTION doesn't quite say "anagram these letters" like MIXED or SCRAMBLED would. Additionally, there's so much flexibility in arranging six letters anywhere inside a phrase that it feels a bit too easy to come up with themers. Still, Kathy chose vivid themers, and she did quite a nice job of pulling together a smooth Monday puzzle, one of the tougher construction challenges out there. Looking forward to more from her. Average word length: 5.05, Scrabble score: 306, Scrabble average: 1.64.